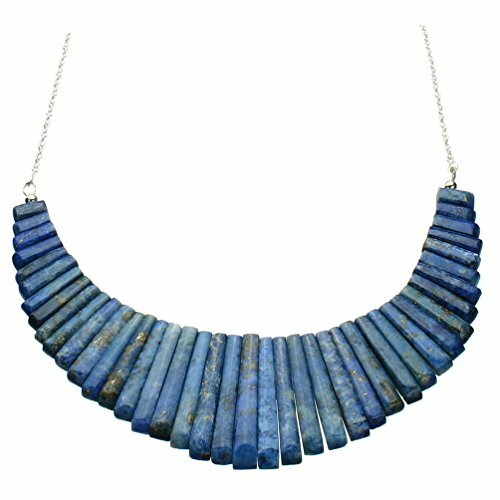 Blue lapis (dyed) stone is cut and polished to form this multi-piece focal for a one-of-a-kind necklace. The lapis (dyed) pieces are extended by a simple cable with chain links that are approx 2.4mm long by 2mm wide. We imported this beautiful, new sterling silver chain directly from a leading Italian manufacturer. The solid sterling silver chain is marked with 925 and ITALY and the clasp is marked 925 so you know that they are of the top quality. Length is from loop end to clasp. Chain is nickel free. Naturally-occurring imperfections may be present, adding to the unique beauty of each piece. The natural properties and composition of mined stones define the unique beauty of each piece. Stones may have been treated to improve stability, durability or appearance. The photo typifies the pendant's size, shape and coloring but each one is different. Gift box color or style may vary. If you have any questions about this product by Joyful Creations, contact us by completing and submitting the form below. If you are looking for a specif part number, please include it with your message. Silpada Sterling Silver Asymmetrical Collar Necklace, 16.5"